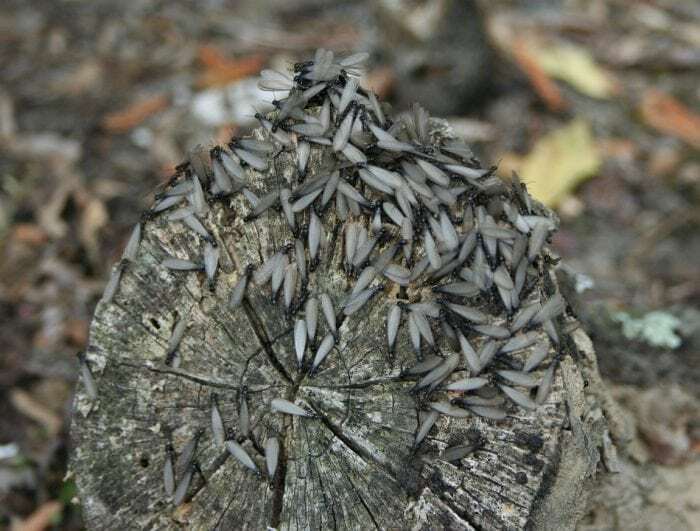 While some people think that termites with wings are a specific species of termite, flying termites are actually just one form of the termites that exist within a termite colony. The flying termites are breeding termites, whose purpose is to reproduce and create new colonies of termites. These flying termites become the kings and queens of their new colonies. Let’s take a closer look at termites in general to contextualize the flying types of termites. Termites are detritivores in the Blattodea order of insects. As detritivores, they consume a variety of decaying matter, such as dead plants, wood, and feces. Many types of termites eat cellulose and have specialized metabolisms capable of breaking down the fiber in cellulose. Termites can be found on every continent, with the exception of Antarctica. South America has over 400 different species of termites. Asia is home to around 435 different species of termites, with most of them living in China. 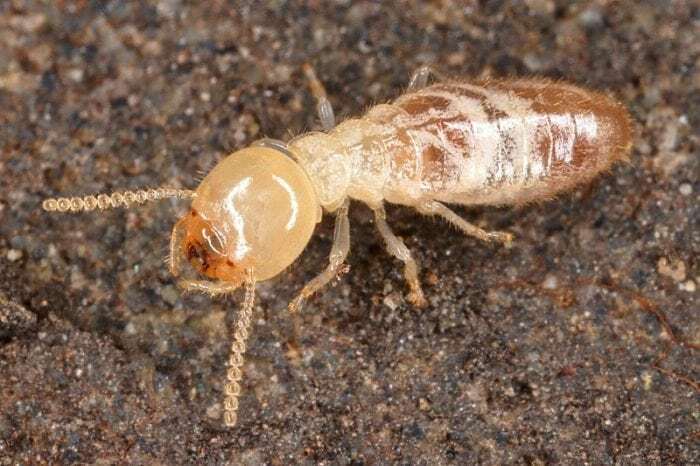 Australia has over 360 different termite species. Europe and North America have comparatively little termite diversity, with only ten known species in Europe and 50 known species in North America. Termite groups are divided into three different ecological groups: subterranean, drywood and dampwood. Dampwood termites are found exclusively in coniferous woods, while hardwood forests are home to drywood termites. Subterranean termites colonize a wide variety of different regions. 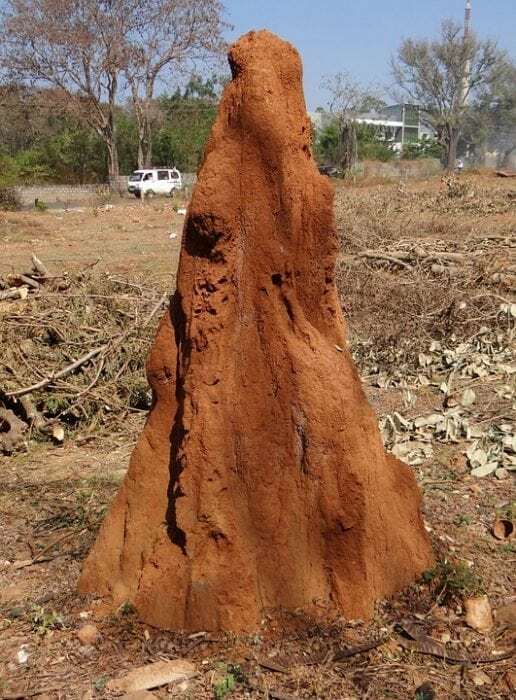 Termite nests are built in one of three ways: a nest built completely underground (subterranean), nest built mainly underground but with some regions protruding out of the ground (epigeal), nest built above ground and connected to the nest via a series of shelter tubes (arboreal). Illustration of wings and arms. Photo: Engel, M.S. ; Grimaldi, D.A. ; Nascimbene, P.C. ; & Singh, H. (2011). 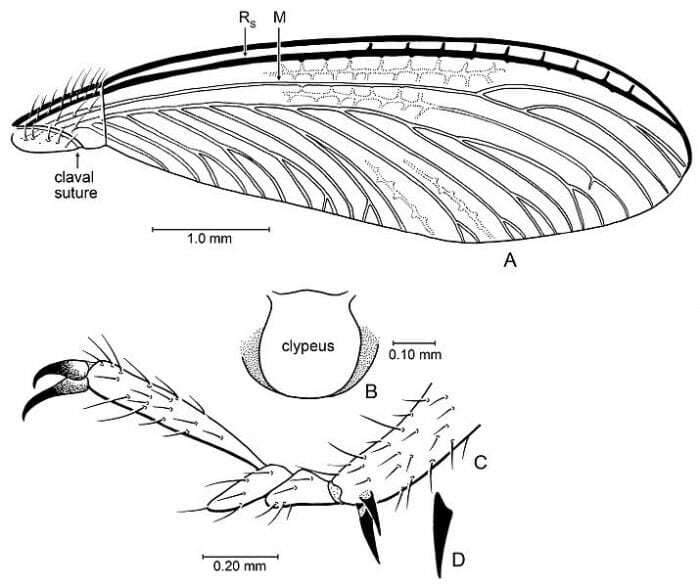 “The termites of Early Eocene Cambay amber, with the earliest record of the Termitidae (Isoptera)”. ZooKeys 148: 105-123. DOI:10.3897/zookeys.148.1797, CC 3.0. Termites have some resemblance to ants, but by taking a close look at the insect it is possible to determine if it is an ant or a termite. Ants tend to have pinched waists while termites have straight waists. Likewise, termites have antennae which are straight while ants have antennae that are bent. The wings of flying termite are all the same length while the wings of ants are of varying lengths. These general differences in body shape can help you determine ant from termite. You can also look for wings left behind near window sills. Flying termites shed their wings, while ants will not, meaning that if you find discarded wings lying around you should be wary of termites. If you suspect termites you should call a professional to make an identification and to see if the termites are harmful/need removal. In almost every known species of termite, the soldiers and workers that live in the colony are blind. They don’t need to see because they will spend their entire lives within the dark tunnels of the nest, so they have no need for eyes. Only the termites that will end up reproducing need eyes, as they must emerge from the colony and navigate the world above ground to find mates and create a new colony. The termite soldiers hit their heads against the walls of the colony to signal dangers to the entire colony. Termite soldiers have long mandibles that they can use to protect the colony. The regular workers for the colony are usually about a quarter of an inch long and a pale tan color. Termites communicate with pheromones, influencing one another’s behavior and speaking to one another through these chemical signals. Termites have glands that leave scent trails behind for other termites to follow, much like ants. Only the reproductive termites have wings and are capable of flight. These reproductive termites are called alates, and they will leave the colony and search the world for mates. They frequently travel in large swarms. Every male and female pair of alates will break off from the swarm and land somewhere to being their new colony. Their wings detach from their body when they land and begin producing offspring. The alates then become the kings and queens of the new colony. The queen of the colony will keep producing eggs and the king of the colony stays alongside the queen, fertilizing the eggs and helping to feed the young termites with predigested food. Subterranean termites are the kind that is most common throughout the US and Europe and are believed to be responsible for around 95% of the damage termites do to structures. Subterranean termites have a caste system, and millions of termites living within one colony. Drywood termites don’t do anywhere near the amount of damage that subterranean termites do. However, they still can still harm structures located throughout the US. The drywood termites tend to be a little bigger than subterranean termites, and are usually about one-half inch in length. Colonies of drywood termites are usually around 3000 individuals large. Since termites make their homes in concealed areas, away from possible predators and environmental hazards, the damage that termites do is frequently severe before any signs of their activity manifest themselves. Termite colonies can easily number if the millions, and with so many termites it doesn’t take very long for them to do substantial damage to a building. Termite control strategies involve things like termite resistant building materials and poisoned soil. Termites are being researched by scientists because they have an ability to create energy through the process of metagenomics, creating hydrogen in the stomachs as they digest food pulled from their surrounding environment. Some researchers are interested in using metagenomic principles to possibly create hydrogen that could be used as renewable sources of energy. Though termites are often considered a nuisance to humans and human structures, they play an important role in the larger ecosystem and environment. Termites decompose decaying and dead trees, breaking these down into new soil that can grow new plants and trees.